"if more than used for brushing is swallowed get medical help or contact poison control center right away"
It is hard to believe that something used on a daily basis could be so risky. I recently read an article stating that sixty or seventy years ago, sodium fluoride, active ingredient used in toothpaste, was used to poison rats before it became a household regiment for cleaning teeth. Does all this mean that sodium fluoride is fine as long as it's not swallowed or ingested? I don't think it takes a rocket scientist to appreciate that something taken orally is going to be absorbed, both sublingually and buccally. Of course, this doesn't account for the amount that is inadvertently swallowed. We just touched on the active ingredient on toothpaste, the inactive ingredients are also under debate. So, do you really want your family using traditional toothpaste? No way! now there are some safe alternatives. One that is making headlines is called OraMD. OraMd is an all-natural oral hygiene product that is comprised of pure botanical oils that consist of; almond, spearmint and peppermint. A key benefit of spearmint and peppermint are that they are natural antiseptics. They naturally banish bad bacteria in the mouth and create a healthy environment. A much better approach to oral hygiene than toothpaste. 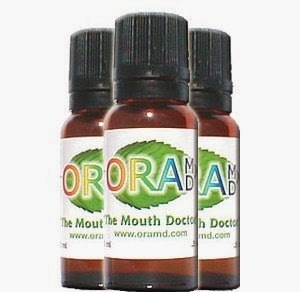 Other benefits of OraMD is that it's a three-in-one product; toothpaste, mouthwash and breath freshener. A small bottle is made to last. It also very convenient to carry in my handbag to use after meals. It leaves my mouth fresh and clean. i would like to try the Colon Normalizer. I am using the Beautiful AM moisturizer and it's very nice. I would give the PM a try! I was really hoping it could be used for babies because it was so safe and natural. Its for 3 and up. Drinking carbonated drinks regularly damages your teeth badly. I learned that OraMD is less expensive than the products I use now. I'd like to try the colon normalizer since I have IBS. I learned that (gasp) it's possible to drink your teeth away! I learned the difference between the original and extra strength formula, one being that the extra strength is best for more serious conditions: Advanced Gum Disease, Periodontitis, Loose Teeth, etc. I'd love to try the reliefMD. I have used the beautiful moisturizer and I love it! I like that the product is vegan and not tested on animals. i learned that there are some really great health information links that tell you about all kinds of common mouth and teeth issues. Wow ! didn't know that about my toothpaste but it is great to learn about other products like this one! I would like to try it and i'll definitely look into this saving ! I'm an advocate of getting fluoride out of our water and products. I switched many years ago to non-fluoride toothpaste. Maybe I will try the OraMD. One of the other early uses for sodium fluoride was the Nazis giving it to the inmates at the concentration camps to make them more docile. Makes you wonder why they are putting in our water supply. It has also been proven that it doesn't help teeth health and actually can hurt with acid fluoridosis. I think this is such an important topic that does not get talked about enough. I can't believe people think sodium fluoride is good for you. I just registered to get a free bottle of OraMD. I don't want to use toothpaste if there is a vegan, non-gmo product available. Who knew that everyday trusted toothpaste brands could be harmful is swallowed. That is so scary! I'd much rather use a all-natural product that won't poison me or my family. I am sure this toothpaste is fine to use and does a good job. Routine brushing will take care of the job of caring for your teeth. Don't agree with sodium fluoride being crucified because it was used for other purposes. Opinion plays fast and loose facts. It is the dose that matters. I have never really thought about the toothpaste I use, other than is it on sale and do I have a coupon. I would like like to try this brand. I think if it was that bad for us, you would see people dropping like flies from brushing their teeth. My big problem with toothpaste is that almost all contain SLS. I'm told it is there to make it foam, just like it's in shampoo to make suds. Problem: I'm mildly allergic. So, I'm constantly looking for toothpaste without SLS. I'll check this out!